Jeff Kale thought his home town of Amarillo Texas was as ordinary and unspectacular as the table-top flatness of its terrain, but his life changed forever when his buddy’s car was smashed into the overpass—leaving him with permanent brain damage and questions he was unable to express. Who ran them off the road, and why? And how was he going to be able to regain his speech abilities, and reclaim his life? Karen Applegate wasn’t his high school girlfriend—she’d made that clear up front, but as an aspiring reporter, she was happy to help him dig for the facts. Soon, that led to parts of Amarillo’s past that they’d never imagined and into dark secrets that they’d rather not know. 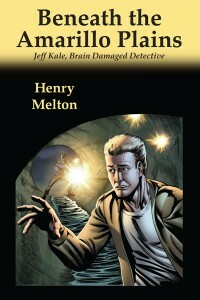 Henry Melton has been writing science fiction adventures that have featured interesting locations in his Small Towns, Big Ideas series, but he had neglected his own home town of Amarillo until he realized that events of his youth and parts of Amarillo’s history that seemed ordinary at the time formed the core of an intriguing mystery. Come share the secrets that lie just below the surface.